World Patent Marketing, a vertically integrated manufacturer and engineer of patented products, announced that Al Konetzni, a retired submarine naval commander, has joined its advisory board. Known as Big Al, he commanded a team against the Russians as he chased their sub through the Arctic Sea. The pursuit lasted weeks, long after they had run out of supplies, and he described the crackling of the ice as, “loud and maddening,” but still he persevered. His adventures were recounted in the BBC television series, The Silent War. By the time he retired, Big Al had risen to the rank of naval commander of the Pacific fleet. Having begun his career in 1962, Konetzni knew he wanted to be a naval officer from an early age, inspired by the Men of Annapolis TV series. He graduated from The United States Naval Academy in 1966 and went on to attend a number of schools including The Naval Submarine School in Connecticut and The Nuclear Power School in California, eventually earning his Master’s Degree from George Washington University. His first assignment on a submarine was in 1968 on the USS Mariano G. Vallejo. 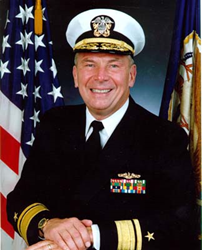 He rose through the ranks and became Chief of Staff for the US Atlantic Fleet in 1991 and served in Yokosuka, Japan as Commander of Submarine Group SEVEN. By 1998, he was the Commander of the entire US Pacific Fleet Submarine Force, a rank he held until he retired. Konetzni loved his work and described the unpleasant and challenging conditions of a cramped underwater vessel as an opportunity to bring down formal barriers and level the ranks. Konetzni understood the importance of chain of command but he also knew how to get the most out of his men. His nickname, Big Al, was a term of affection he had earned from years of work with his loyal men. He was so admired that his retirement was attended by over 500 people, including famous celebrities like Larry King. Due to his valor and commitment to his country, Konetzni has earned multiple medals such as the Legion of Merit with a silver star, the Meritorious Service Medal with two gold stars, the Navy and Marine Corps Commendation Medal with two gold stars, and the Navy and Marine Corps Achievement Medal. He was also awarded the Order of National Security Merit Cheonsu by The Republic of Korea in 1997. Working as a submarine commander is a highly technical and demanding job. This is the kind of practical experience Konetzni brings to the World Patent Marketing Advisory Board. His connections to the highest levels of military command, knowledge of naval warfare and tactics, as well as his ability to get the best out of people make him an invaluable asset in World Patent Marketing’s constant pursuit of new and innovative inventions. The CEO of World Patent Marketing, Scott Cooper, is also a Director of The Cooper Idea Foundation, is the founder of the New York Inventors Exchange and has also been a proud member of the National Association of Manufacturers, Duns and Bradstreet, the US Chamber of Commerce, the South Florida Chamber of Commerce, the Miami Beach Chamber of Commerce, the Greater Miami Chamber of Commerce, the Association for Manufacturing Excellence and the Society of Plastics Engineers.